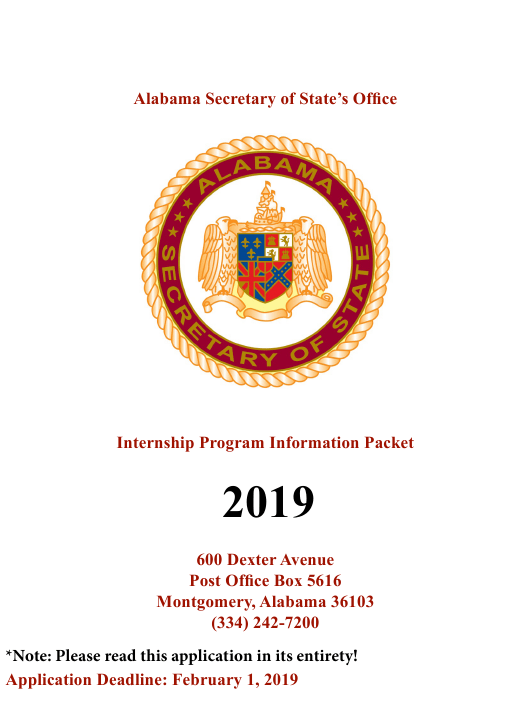 This printable "Internship Program Information Packet" is a document issued by the Alabama Secretary of State specifically for Alabama residents. *Note: Please read this application in its entirety! agency and information handled therein. Please follow the provided instructions to complete the essay and internship application. Year University. Please submit completed information as requested. your application at any time for consideration. Regulations and interpretations of statutes issued by state regulatory agencies. notaries public registered in Alabama. are filed by attorneys and banking institutions. cates of election, commissions, and oaths of office are also on file for many elected officials. This opportunity will allow them to integrate classroom theory into practical principles in a work environment. This process will give them diverse knowledge in areas handled by the Secretary of State. cient material to complete all tasks. to prepare for upcoming events. your contributions to the agency. tion have been listed below. of State’s Office are expected to be at their work stations at the time designated as their regular work schedule. Please direct all questions to your supervisor or their appointee upon their absence. this internship. The letter must be received before you can be considered. There is an essay requirement, as well.